Sunday Morning Bluegrass Gospel in the Garden! Some of us at the Folk Music Society have yearned for and dreamed of an outdoor morning bluegrass gospel set, something that is pretty common at bluegrass festivals, but we didn’t want to plan a whole festival. 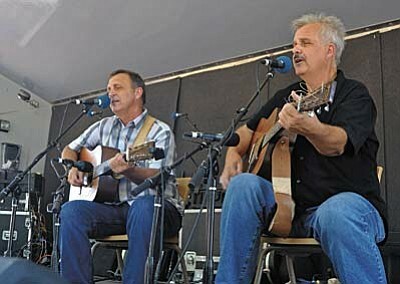 Why bluegrass gospel? Those harmonies are just so pure and earnest. If you don’t know this sound, you’d better come take it in. Why in the morning? While this won’t be a religious show per se, and there won’t be a sermon, the Sunday morning will bring us all closer to the roots of this music. They will be singing both traditional songs and original compositions. When we found out that Eric and Bud would be in Southern California over the weekend for a bluegrass festival down near San Diego, we started hunting for a venue around Pasadena, and realized that Arlington Garden, a long block south of Huntington Hospital, in Southwest Pasadena, would be a great place for such a show. This land was the site of a 50 room mansion secluded off the old Millionaire’s Row, South Orange Grove Boulevard, until the home was razed and the land became slated to be part of the controversial Long Beach Freeway. It stood as a neglected vacant lot for 40 years, until some imaginative and hard working volunteers began to plant trees and transform the property into a lush drought-tolerant native plant demonstration garden and a delightful place to spend a few hours. Those who whiz by on Pasadena Avenue don’t realize the beauty they are passing, unless they turn west on Arlington Drive and get out of the car and walk a bit. The garden is free and open to the public 7 days a week from dawn to dusk. 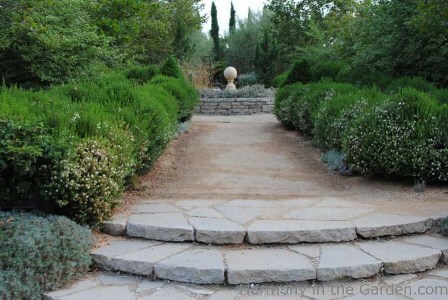 The property now consists of many separate garden areas and this show will be in the olive allee, past the Italian pots, Spanish Lavender olive trees and a busy birdbath. Find out more about the garden at http://www.arlingtongardeninpasadena.org. Come take in the music and the garden! The show starts at 9AM. Tickets for the show are $15 for adults and $5 for Caltech students and children. Tickets can be purchased on the phone (626-395-4652) with a credit card (a service charge will be added per order), purchased at the Caltech Public Events Ticket Office at the Winnett Student Center for face value (Generally open Monday-Friday 9AM-4PM) or, supply permitting, at the garden on the morning of the show for cash (sorry, no credit cards at the garden.) Be aware that the garden does not have built in restrooms, but there will be a porta-potty available. It will be necessary to walk up a few steps and guests will need to be able to navigate walking on gravel and decomposed granite walkways. The garden does not have a parking lot, but there will be street parking on Arlington Drive between Pasadena Avenue and South Orange Grove Boulevard, and above and below Arlington drive on Orange Grove Boulevard (parking is permitted on Sunday mornings). Note that parking is NOT permitted on Pasadena Avenue. Carpooling is encouraged! The address of the garden is 275 Arlington Drive, Pasadena, CA 91105.